The way we buy mattresses is undergoing a revolution removing the previously tedious process of going from showroom to showroom under pressured by commission-driven salesroom staff. Now there is a new breed of mattress retailers that are based solely online removing the jargon and making the mattress industry easy to understand. One of these new retailers is Emma Mattress, and although they are relatively new, they have quickly built up a strong reputation gaining a host of awards in the process. We know that the mattress buying process can be confusing and time-consuming so we’ve created this in-depth Emma Mattress review guide to show you the pros and cons of the mattress so you can make an informed decision about whether it’s the right option for you. Emma mattress is a Germany founded mattress manufacturer and retailer born out of the frustration of the traditional showroom experience aiming to streamline the full process of buying a new mattress. The mattresses themselves are made in Britain and are the result of an extended period of testing and research while partnering with the leading manufacturers to develop the innovative foam mattress technology. The mattress is assembled in various locations around the UK and unlike traditional retailers who have dozens of product SKU’s they have two being the Hybrid and the Original. The top cover of the mattress is a unique climate fibre which works to regulate temperature and humidity. It also has an elasticity quality which means it fits perfectly on the mattress while also being easily removable. The colour scheme used by Emma is clean and simple but works well. This top cover is made of 98% Polyester and 2% elastane while also being removable and washable so you can keep your sleeping surface clean, fresh and germ-free. It's made using Airgocell foam which has exceptional elasticity and responsiveness leading to a high level of comfort. It also means that if one area is compressed, it doesn’t affect the rest of the mattress. It acts similarly to latex and promotes airflow, so you don’t overheat while you sleep. Built into the mattress are up to 2000 individual conical pocket springs. The number of pocket springs that your mattress will have depends on the mattress size that you purchase. Each pocket spring works independently to provide support and relieve pressure along your body. Pocket springs also work to add increased levels of bounce and balance helping you to achieve restful sleep. The Visco elastic memory foam sits within the middle of the mattress and works to contour around your body to relieve the pressure across the delicate parts of your body such as your neck and spine. Like all memory foam, this adapts to the shape of your body to create a hugging feel. 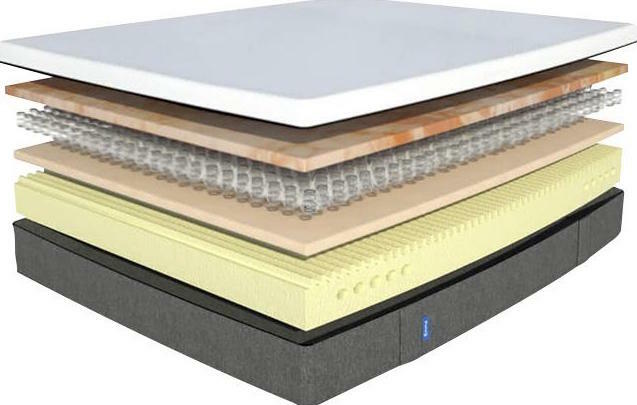 This firm bottom layer base features a cold layer of foam which not only provides support for the rest of the mattress but provides counter pressure against your sleeping position, especially towards your back. When you lie on the Emma Mattress, it quickly adjusts itself to fit the shape of your body using its special progressive sinking technology. It's pressure sensitive and reacts to the level of pressure that placed on it to provide the maximum level of comfort. It allows the mattress to adapt to the contours of your body, so it feels incredibly comfortable to lie on. It also helps to align your spine and provide support regardless of your sleeping position. The materials used in the mattress allow for it to be self-regulating and adapt to your body regardless of your weight or size. The base has a dark grey cover which promotes air circulation while also giving the mattress an aesthetic and stylish look. The antislip quality of the cover also ensures that it stays firmly in place at all times. Ordering the mattress is as easy as ordering a pizza, you simply navigate through their website, select your mattress size of choice, complete the payment details and then the mattress is on its way to you. If you do have any further questions when on site, then there are multiple ways to contact them including the onsite live chat feature which is great for a quick response. Shipping is free and via UPS and usually takes a couple of days. If you require your mattress to be delivered on a Saturday, then this does incur an additional cost of £35. If you wish to get your old mattress to be taken away, then this is an option that you can select as a checkout option. Emma Mattress will send a different company called Tag Trans who will remove your old mattress from your address. As you know, the mattress is delivered in a box as the mattress is rolled and vacuum-packed to allow for this. This means once you receive it you can transport it to your room of choice; however, these boxes can still be quite heavy so you may need some help from the delivery service. Once you remove the airtight packaging, the mattress quickly restores to its original size, and in just a few minutes it's then ready for use. Emma includes a simple to use plastic cutter which makes it easier to cut through the plastic packaging layer without damaging the mattress itself. Similar to all new products, the Emma Mattress will have a new smell to it especially because of the memory foam layer. This smell only lingers for a few hours because of the high-quality materials that are used. If this does become a problem, then keeping the mattress in a well-ventilated room for a few days should remove the smell. So, performance is the most important thing, isn’t it? The way it performs. It can be easy to be sceptical of mattresses that claim to cater to all types of sleepers, so it's important to put this claim to the test. If you’ve ever used a memory foam mattress, then you’ll be aware of the hugging feeling as the foam contours to your body and wraps you in. However, the Emma Mattress doesn’t have this feeling due to the Latex and Spring-coil layers which add a bit more bounce to the experience which gives it a great feeling. The added springy feeling allows you to move more easily. This springiness makes it great for sleepers of all positions especially for those who have the problem of sinking into memory foam. The mattress compresses less and reacts well to the pressure. Emma has nailed the balance between sinking memory foam and bounce back. The mattress overall will improve your sleeping pattern, and you’ll find that not only will you get more sleep, but when you wake up, you’ll be feeling refreshed and energised ready to attack the day. Although it's suggested that you take 3-4 weeks to get used to the new mattress, it’s not uncommon for users to feel the benefits and superior sleep experience after just one day. Mattress retailers often recommend that you regularly flip your mattress to retain its shape and quality over the years. The Emma Mattress doesn’t require this because for the mattress to work correctly, the foam layers need to remain in the same order. So there’s no need to worry about turning the mattress. Overheating is one of the worst feelings when you’re trying to sleep, but the mattress is constructed to reduce this as much as possible providing a cooler sleeping surface. It's mainly due to the latex and coiled structures so you can avoid a hot sleeping experience. The Emma Mattress has gained a noticeable level of industry attention due to the strong quality of the mattress. In 2017 it gained the coveted "Which? Best mattress Buy". Which is the largest consumer body in the United, so it’s a very strong accolade to receive. Which? Tests mattresses as an entire category which makes the win even more impressive, so you can trust that you’re buying a top quality product. These awards aren't just been limited to the UK, with the company picking up awards in Germany, Italy and France in best mattress categories which are no small feat considering the competing brands. The Mattress has four separate layers featuring a combination of decompressing Airgocell®-layer, visco-elastic memory foam, pressure-relieving pocket springs and supporting layer of cold foam. These layers all work together to provide a temperature regulating, comfy and supportive sleeping experience. Included with each purchase is a 100-night trial allowing you to sleep on the mattress for up to 100 nights to see if it’s the right fit for you. It's significantly better than the traditional mattress buying experience where you lie on a showroom bed for 5 minutes and make a decision on a mattress that you might use nightly for the next ten years. In combination with the 100-night trial, if you decide to keep the mattress, you are enrolled into a ten-year warranty program. A bed is a long term investment, so you want the product to last this amount of time, so if any defects develop with the product within this time, then Emma-Mattress will either repair or replace the mattress free of charge. Due to the top Latex layer, there is a limited level of motion transfer which is hugely important if you share a bed with another person. It means that if you move in your sleep, the other person will not feel this movement leading to a higher quality sleep with fewer interruptions. The Mattress has been designed to be low maintenance which means it can be laid on any flat surface, whether this is on the ground, a slat frame or box spring. All that matters is that the surface is dry and clean. Because Emma-Mattress have cut out the middlemen and have no retail locations, this means that these savings can be passed onto the final consumer. It has led to the mattress being priced extremely competitively especially considering the high quality of the mattress itself. Although Emma Mattress have put a lot of time and energy into creating a top class mattress they have not stopped there, and have put time into developing complementary products that benefit the mattress. These include pillows, bed bases and mattress protectors which work to enhance your sleeping experience further. The mattress is proudly constructed with the United Kingdom using premium materials and manufacturing equipment. So, if you do decide to purchase the mattress, you will also be bringing benefits to the local economy and local workers. The mattress does have a relatively low weight limit of up to 130kg or 20.5 stone per person. If you are over this weight and decide to use the mattress, then you may experience support issues. Emma Mattress had the core goal of making a hybrid mattress that is suitable for all types of sleepers. It's ideal for those who want a medium firm mattress while also being responsive to movement due to the pocket spring coils and latex layers. The memory foam then works impressively to contour to the shape of the user’s body. The 100-night trial means that you have nothing to lose by giving the mattress a try and the industry awards that it’s received shows the high quality of the mattress and has a well-balanced feel to it. It’s clear that Emma Mattress isn’t a fly by night retailer but is here for the long haul to stamp their authority on the mattress market and they’ve made a very strong start. Still want to discover more options? Check out our top bed picks with a variety of choice.